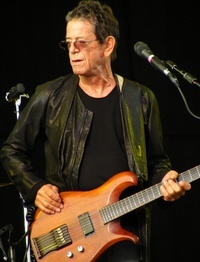 Lewis Allan "Lou" Reed (March 2, 1942 " October 27, 2013) was an American rock musician and songwriter. After being guitarist, vocalist, and principal songwriter of the Velvet Underground, his solo career spanned several decades. The Velvet Underground were a commercial failure in the late 1960s, but the group has gained a considerable cult following in the years since its demise and has gone on to become one of the most widely cited and influential bands of the era " hence Brian Eno's famous quote that while the Velvet Underground's debut album only sold 30,000 copies, "everyone who bought one of those 30,000 copies started a band." After his departure from the group, Reed began a solo career in 1972. He had a hit the following year with "Walk on the Wild Side", but subsequently lacked the mainstream commercial success its chart status seemed to indicate. In 1975, Reed released a double album of feedback loops, Metal Machine Music, upon which he later commented, "No one is supposed to be able to do a thing like that and survive." Reed was known for his distinctive deadpan voice, poetic lyrics and for pioneering and coining the term ostrich guitar. This webpage uses material from the Wikipedia article "Lou_Reed" and is licensed under the GNU Free Documentation License. Reality TV World is not responsible for any errors or omissions the Wikipedia article may contain.